Singularity - "Between Sunlight and Shadow"
Singularity crafts the kind of progressive rock that isn’t about showing off and playing fast, or mind bogglingly complex arrangements. Instead, the Boulder, Colorado trio’s music is about mood, emotion, melody, texture, and atmosphere. You could almost say they walk that shadowy middle ground between progressive and space rock. Between Sunlight and Shadow, their second full-length release, is a concept album. The fifteen tracks flow effortlessly, one into the next, drawing the listener on a twilit journey into the mind of a lost soul searching for home, or at least for a light in the darkness. Lyrical and musical passages recur occasionally, deftly tying the themes of the album together. From the opening piano notes and rushing of cars passing on the highway, the album takes the listener through many different landscapes of sound: the thoughtful and restless piano of Drive, the dark tones and spacey textures of Stratum, the wild, exhilarating synthesizer rush of Flight, the heavy and driving metallic fire of Inferno, the emotional longing of Hold a Candle, the acoustic and classical simplicity of Still, and the melancholy symphonic beauty of Infractus. Jamie McGregor’s drumming and Matt Zafiratos’ bass form the framework for John Green’s multiple layers of keyboards, which range from deliciously moody atmospherics to fiery solos. Zafiratos doubles on guitar adding both subtle and riveting passages. McGregor’s drumming is refined and sensitive to the needs of each piece, whether he’s pounding the skins, or adding touches of gentler percussion to the more atmospheric moments on the album. While I’ve not had the opportunity to listen to their first album, I’ve heard it was often compared to the music of Rush. On their latest, Singularity have obviously jettisoned most of the Rush influences in favor of a unique, multi-faceted progressive sound that is all their own. The samples on their web page promise a haunting and electrifying experience. Between Sunlight and Shadow delivers thoroughly on that promise. 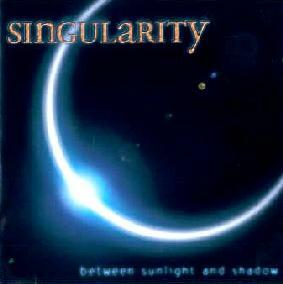 Visit Singularity at their web site: http://www.singularity.net.